I was asked the other day how I paint blood splatters. 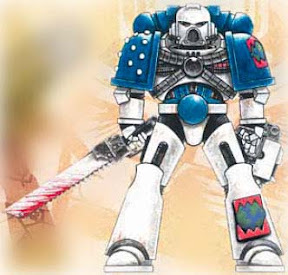 You see it on Pre-Heresy World Eater armies all the time. It's almost a requirement to painting a force in that color scheme. Painting blood can be tricky though. It's one of those things that can be hard to explain, but you just know what looks "right." 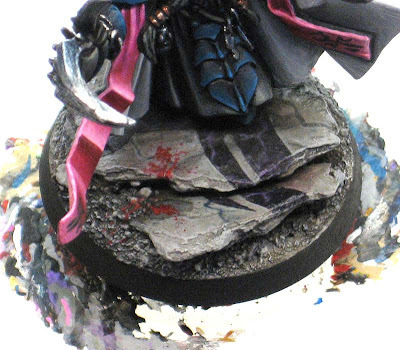 Even GW is in on the act, their pic on the right there shows that they've added blood to their artwork as well. I'm going to show you how I do it and more importantly, the two things I think you should know above all others when it comes to applying this technique in particular. If you take nothing else from this tutorial, it should be these two things. You wouldn't think you'd need to plan out your random blood splatter. Nothing could be further from the truth. A well placed blood spatter really draws attention, but not so much as to become the focus. You want emphasis here, not spotlight. Get a test model and try out some different patterns. See what looks "best" or appropriate. We're talking about both the amount of blood and the actual pattern or design of the splatter. Remember, less is more here. It doesn't take much to show "splatter." It can be a fine line between that and rolling around in the stuff. I'm going to limit myself to human blood here and keep away from Xenos effects. Once you go that route, all bets are off and the sky is the limit. I can't think of any times I've seen it done, but I'm sure it could make for some amazing effects if done well. I use two paints to get the effect. 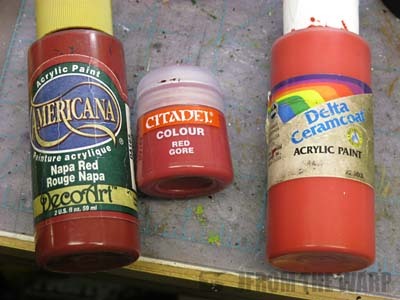 A dark red (Americana Napa Red) and a bright red (Delta Ceramcoat Bright Red). You could substitute the Americana Napa Red with GW Red Gore if you wanted. It too is somewhat dark and transparent. The dark is for the dried blood and the bright red is for the stuff that is still wet. Blood, when it splatters, will dry fairly quickly and since most of our "drops" are not that big, they will dry fast. So... most of the effect is done with the dark red. In certain areas where there is a considerable amount of blood (similar to larger chipped paint battle damage where you go in and add silver over black) I will add the bright red over the dark stuff to show that it's still somewhat wet and has not dried yet. Hmmm... I bet there are a hundred different ways to do this. Dave G from N++ Wargaming uses this approach to get a nice blood splatter effect. I start out with an older brush (not a big one though) that I use for drybrushing where the tip is completely destroyed and the bristles are going everywhere. I use this one to lay down the larger areas of blood by dabbing it on the surface where I want the blood to be. After that, I'll go in with a super detail brush and add a few spots here and there until I get the look and pattern I want on the surface. Remember, less is more here! You don't need tons of blood to be gory. So let's go back to my one and only example, you can see I have three little main areas in a line (moving at an angle outward opposite the marble striping on the rocks) with a few extra spots around those. I really worked at keeping the scale in mind and not overdoing it too. It's no accident the three larger areas are somewhat lined up moving outward in the direction they are. That was the planning aspect. I went through about a half dozen different patterns until I found one that fit with the model and its pose. It comes down to personal preference at the end of the day. It's your army and they should look the way you want them too. Adding blood splatters to a few key models can create an amazing look and feel to a squad. Keep scale and volume in mind and you won't go wrong. Wow, that looks great! I've personally always had trouble with the scale and still have trouble putting convincing blood streaks on blades and such. Funnily enough, this is exactly what I was looking at yesterday. Hmmm, I have a request for a suggestion. For my models I've been trying to create a "blood spatter streak" along the torso/or helmet of my troops (idea being a bloody decoration of slightly insane veterans of war). Would this be an appropriate technique to try and create that effect? Edward: Scale is everything here... get it the "right" size and you have some wiggle room in other areas. If the scale is off, the whole thing will be off. ariandynas: You have no idea how many times that happens to me too. Anon: Absolutely. Take your smallest brush and try a combination of short streaks and then dots. A few test models should get you started. Keep in mind the scale and with something like this, less can be more too. Just a suggestion of the blood streak can be enough sometimes. Perfect timing for this article as i'm just about to add some splatters to my Beastmen. Spiderpope: Perfect, make sure to post and let us know how it goes. Back in the day I had the perfect recipe for fresh blood, citadel red ink mixed with black ink, perfect result. Too bad they got rid of those TT. Thanks for the link Dave, I added it into the post for other to check out.